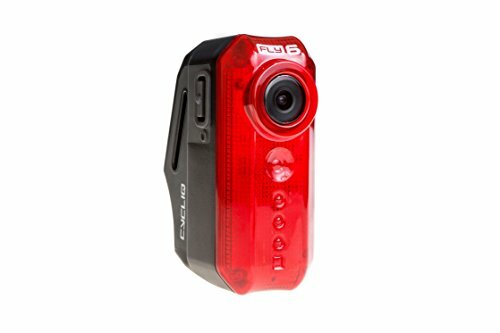 Fly6[v] - HD rear Facing bike camera with integrated 30 Lumen tail light for cyclists. With up to 6 hours of battery, Fly6[v] records in HD all that happens behind you so you can enjoy the ride ahead. Fly6[v] will make sure you capture all the action, faces and license plates behind you. Great for commuting, weekend riding, MTB, family rides and training. The audio and video Fly6[v] records is valuable proof should you need to contact the authorities or insurance companies about an incident. Fly6[v] has looping video, which means you'll never run out of memory space on your SD card (included). The Incident Protection Technology makes sure that your footage is stored safely should an unfortunate incident happen. The 30 lumen light has various settings (including off/camera only mode) and makes you visible to other road users day and night. The Velcro strap attaches Fly6[v] firmly onto any seat post and provides an easy and durable quick release solution (fits aero bikes as well).